Happy Tuesday and Happy New Year!!! I hope everyone’s year is off to a great start! I’m starting the year off with a monochrome moment, and I’m showcasing these gorgeous velvet boots that Ego Shoes sent over. If you’re not familiar with Ego Shoes, check out their website here, and thank me later! I have a few pairs from them, and I love them all. Follow them on Instagram for all of the shoefie and street style inspo that you could ever want or need! Aren’t these boots just everything?! The color, the texture, the length… I just love them! The quality is great, and they aren’t super painful to walk in! I actually wore this outfit to two Christmas parties (on the same night) that I attended a few weeks ago, and I didn’t get pictures in it, so I ended up having to recreate the look twice to get pictures (the sun went down on me during my first photo shoot attempt). Thanks for reading! Are you familiar with Ego Shoes, and would you try a bold color boot like this pair that I’m rocking? Let me know below! I am feeling the idea of a sweatshirt dress. The color scheme is my fave. Are the boots comfortable? The price is not bad at all. I love those boots. I’ve never heard of Ego but I went to their site and immediately saw a few pairs of boots I want to buy. Thanks for introducing me to a new brand. The boots look gorgeous! I’ve never heard of this company but I’d like to take a look at thei store. What a beautiful color on you. I have not heard of Ego but I think I am about to take a look now. Keep up the good work gorgeous. Great outfit choice and beautiful color. I’ve never heard of Ego before, but it looks amazing on you. You better come through! This is one of my favorite colors and I love those boots! I saw when you served this up on IG! I LOVE it. 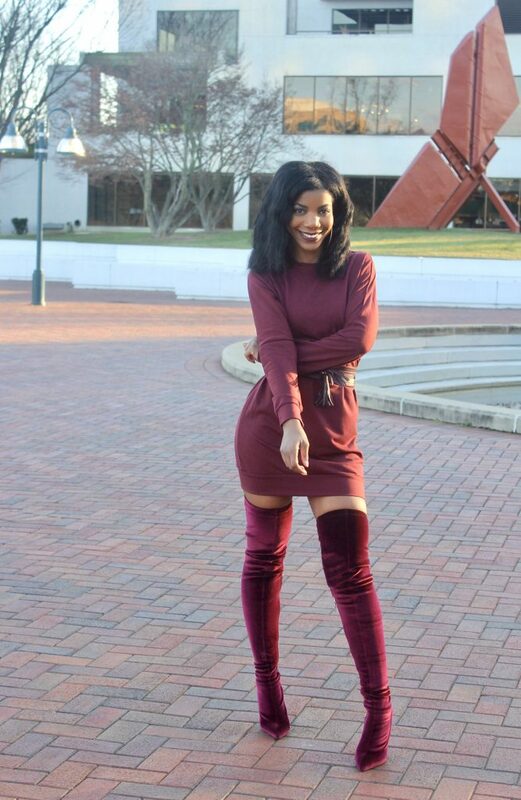 The boots are everything and you are posing to win! You look FABULOUS. You look absolutely stunning in that amazingly chic dress and those must-have thigh-high boots! Love the monochrome styling you did here. Those boots are everything. The maroon really compliments your skin tone. I’m digging the monochromatic look too! I love the belts. Belts have been catching my attention lately. i liked that you dressed sweatshirt dress up, it’s cute! Those boots though! OMG! They’d never fit my thighs but they’re gorgeous! I love it. you betta work!!! I love those boots OMG yes! And the monochrome styling is so chic! I just bought some Michael Kors boots in the same color that are thigh high. My pair are without the heal though. I love how you paired the entire ensemble.